I got the idea for this image from two sources–a shot from the opening sequence of Batman: The Animated Series and a panel from “Wanted: Santa Claus–Dead or Alive!” (drawn by Frank Miller) from DC Special Series #21 (Holiday Special); Spring, 1980. Composition was pretty simple–took the shot of Batman in my light tent, then took a super-macro close-up of the batarang on the floor of the tent. 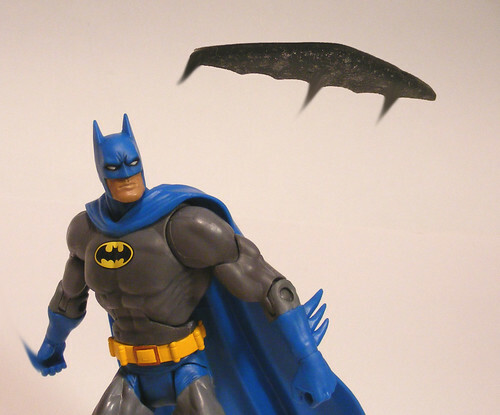 In Photoshop, I cut out the batarang, flipped the image vertically and pasted it into the first photo. Careful use of the Smudge function added the motion blurs. Then the usual retouching and that was that. I wish I had a nicer background, but the white still gives it a certain comics feel. Nice! I see you were able to get off the black on the cowl! Was it easy to get off? It does look much better without the black, though. The nice thing is he left some of the black around the eyes, which gives him a great Neal Adams-esque look. Would your friend be opposed to perhaps providing some instructions for you to post, if he doesn't want people bugging him? I got this guy last night, and the blackface is a look I've always hated on Bats. "I use the Acetone from the paint dept of Wal-Mart. I found out long ago that nail polish remover is just too low strength to get the job done. With pure acetone you're not tempted to rub hard, and thats when you'll damage the surface. The trick is to do it in stages, if you try to do it all at once you'll probably damage the rubbery plastic. Do it over the course of a day. It's tricky to remove the black without smearing the white on his eyes. I used a soft rag to take off the bulk on his forehead then used q-tips to get in closer to the eyes. Then I left it alone for a couple hours, too much acetone at once can "craze" the plastic. Literally starts rolling it up. Then the steady hand work begins – I used those small tip applicators that Testors makes to finish touching up around his eyes. I generally have to use quite a few and they're not real cheap, but they work great." He looks nice, but…I kinda like the black on there. Usually I wouldn't, but it just sets him off from other Batmen. Plus, I think I was just happy to have a Batman that can look up. Nice photo though! I'm sad 'cause I've never used Photoshop: all the crap on my archaic computer is slowly killing it, and Photoshop would be another nail. looks sweet, especially the face. @T-T–Good idea, might try that next time. I think the blur looks OK, though.